A to Z blogging challenge REVEAL! 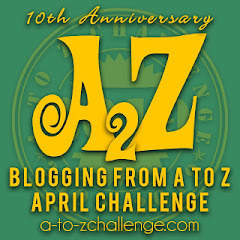 So, a few of us who are doing this year's A to Z blogging challenge joined an additional challenge, and are revealing the method to the madness today. For those of you who don't know about A to Z, it is not too late to join in! I did it last year (see blog history) and it was great fun. But this time, I am setting a theme. The theme is WEIRD PRINCESSES. Yup. I'm gonna be hunting for princesses in folktales, honest to goodness genuine princesses, who are more than just the doll you marry for killing the dragon/saving the kingdom/wearing a really shiny suit. And I am not going all feminist here either. Not all these princesses will be independent, strong, and smart. Some of them will just be weird. 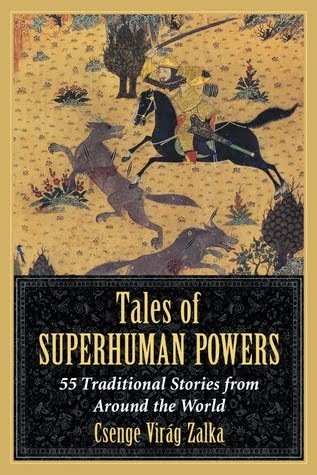 Just to show people folktales are not stereotypes at all. 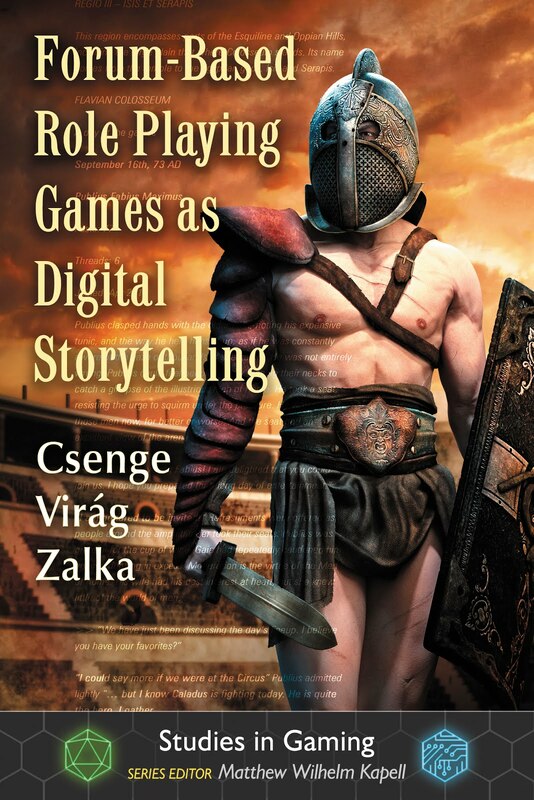 So here is my telling of a folktale that is very popular in Hungary. King Matyas (Matthias) I ruled over the Hungarian Kingdom in the 15th century. He was a Renaissance king who did not only fight against the Turkish empire with his famous Black Army, but also built a library, embraced Renaissance culture, and introduced its music, literature and fashion to the kingdom. One day King Matyas and one of his advisers was out in plain clothes, hunting, when they realized that night was about to fall and they were not going to make it back to the castle on time. The adviser suggested staying the night in the nearby town of Gyevi, and the King agreed with the idea. The two travelers walked into town just as the moon was creeping up on the sky. Some of the local women were outside their houses, peering at them curiously. "There must be a lot of rain where these men come from" one giggled "I have never seen a man so tall and handsome!" Well, that was strange, but the King shrugged it off and walked over to a spacious building nearby. Outside the door a group of men were sharing an evening smoke from their pipes. "Good evening, brothers! Is this the inn?" "Do they serve white bread inside?" "Not even cardinals eat the like." "Not even the Turkish sultan drinks wine like that." The adviser was about to inquire why the mayor has to be exempt from everything, but the king dragged him inside to eat. Once their hunger was satisfied, the King sat back in his chair, smiling at the innkeeper. "Not even the king in Buda has eaten a meal like this today!" he chuckled. "May it serve you well, master" the innkeeper bowed, and then realized he forgot something, and added in a hurry "...except for the mayor." "I am not taking the mayor out of anything!" "Yes you are, master, yes you are!" the innkeeper shook his head, alarmed. "What a strange place this town is, may the devil take it!" "May the devil take the mayor first!" At that point a fat, round little man stood up from a table in the corner and marched over to the King. "It is the law in Gyevi that the mayor shall be exempt from everything!" "I want a word with that mayor!" "You are looking at him." The King looked at the fat little man. "Well, as I said before, may the devil take you, sir." And that was that. The mayor ordered the two travelers to be thrown into jail. But he was curious what kind of people they were, because they looked a little bit too good, so he decided to spy on them. All he could see, however, was the two of them sitting in their cell, writing something on a piece of paper, and chuckling to themselves. In the morning, however, when the mayor woke up, there was a commotion outside his house: soldiers and guards dressed in bright colors surrounded the two travelers who had been let out of jail under the king's orders. As the mayor appeared, the taller of the two unrolled a scroll of paper and started reading. "His Royal Highness Kign Matyas embraces the people of Gyevi into his heart! Except for the mayor! They are all decent people and not idiots! Except for the mayor! He orders that no one should be paying taxes anymore! Except for the mayor! They shall eat from silver plates with golden spoons! Except for the mayor! They shall be given ten gold pieces as a parting gift! Except for the mayor!" Matyas grinned at the mayor. "See? I learned your law well after all!" And with that, the King rolled up the paper, and rode away with his guards. The mayor covered his face in shame, ran away, and was never seen again. Yet another fairy tale movie, yet another blog post that does not aim to be a film review. Fresh home from the theater on St. Paddy's eve, I just wanted to share my thoughts on a topic that is very close to home: Jack making the big screen. First of all, Jack getting a movie has been a running joke ever since Fables gave it a reason (no spoilers, read it!). I have been ticked to death by the fact that someone in Hollywood actually went there. Second of all: the entire thing benefited helluva lot from using great actors. I speak for quite a few people when I say that I would listen to Ewan McGregor and Ian McShane read the phone book, and Nicholas Hoult has been steadily gaining momentum as a very talented young actor with cheekbones to die for. Anyhow. From this point on, my opinions have greatly been colored by the fact that I am a professional storyteller who has spent two years studying in Appalachia. Which more or less means that I could probably tell you Jack's shoe size with three source references if you woke me up at 3am the morning after St. Patrick's Day. Yeah. I have heard people complain that the Jack movie is not realistic and ridiculously over-the-top. People, meet the fairy tale genre. Fairy tale genre, meet people. I have to admit that the historical reenactor in me had mini-fits all through the movie when weapons, costumes and armors were considered, but in the end, it just gave up the fight and accepted it as part of the generalistic nature of fairy tales. One exception was Jack's costume, which had nothing Medieval about it whatsoever, instead he was pretty much wearing jeans and a hoodie. I could totally get behing that. Jack is an eternal hero, every generation needs their own. Hollywood is still not getting the whole "independent female hero" thing quite yet, but they get an E for effort. The princess was the weakest link in the cast, but at least she was a link. Keep workin' on it guys, you'll get there eventually. As for the story itself: I appreciated the small things. The best wink to the folktales came from a line the captain says to Jack "You killed one giant, and that makes you an expert now?" And yes it did. The giant-killing was well done on Jack's part, more smart than strong. The ending of the story was a great plus. It gave a very neat run-down of how stories change from generation to generation, which is kind of the point of the whole thing (also, a fun twist in the tale). 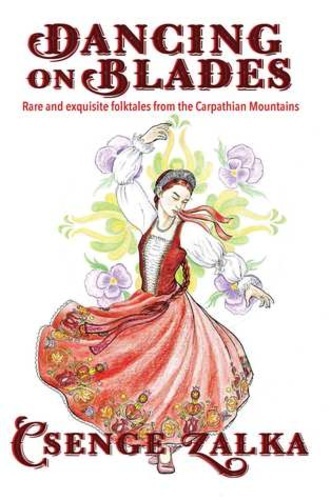 There is no "original" in folktales. If someone wants to take Jack and the giants and play with them, they can do so. Some people will like it, some people won't. That has always been the case. I am not even saying that it made my top list of favorite movies, even though it was fun for a Saturday evening. But now there is not only Snow White and werewolves and Avengers on the daily menu. There is also a guy called Jack. And he'll be sticking around for a very long time. It's World Book Day today. Yay! I like book-related holidays, even if I have to be at work, and read under the counter. Since I am still on a mythical hype from yesterday, I thought I'd celebrate World Book Day by pointing fingers. I realize I have blogged about him before but since then he has put out a book, and that is worth a mention. Because while the myths included will still make you snort oatmeal through your nose, the introduction of the book is so spot on it should be included in any storytelling curriculum. No, seriously, download it, it's on Kindle. Myth On! 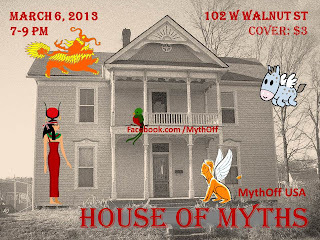 MythOff USA - House of Myth! So once again here we go with the mythologies. Seems like we just can't get enough. In the past four (four!) MythOffs we have constantly been tweaking things to make them more fun and keep them entertaining and interesting. This time, it was the venue: instead of a bar's back room we moved to a Victorian era (haunted) house that a friend of a friend generously offered as a place to be filled with mythology. 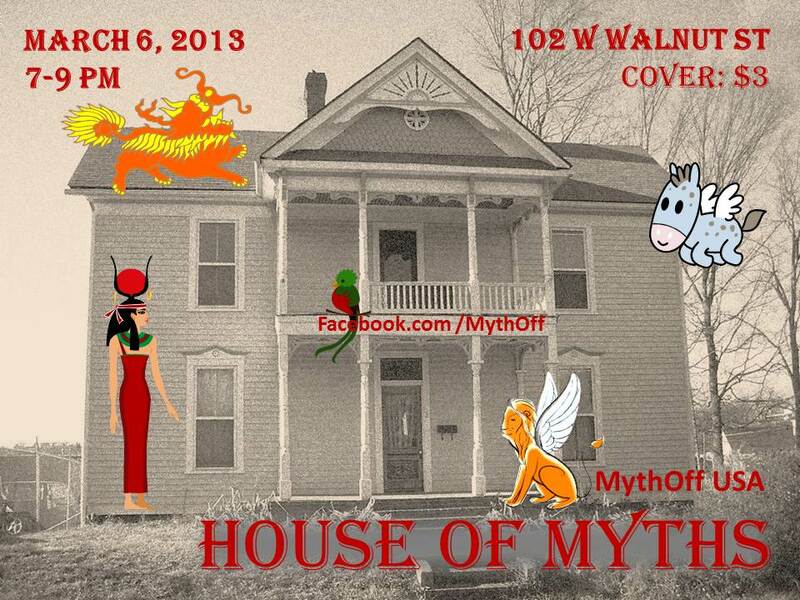 So, instead of just MythOff, we had MythOff in the House of Myth. And it was good. The lineup was also exciting: because so many people put their name in the hat, we decided to go with 8 tellers, 4 rounds, 10 minutes per story. We made this decision because last time almost no one hit the 15 minute mark, so the shorter time worked well, and also, we had a lot of new people eager to tell myths, and we wanted to give everyone a chance. In the end, one teller sadly fell ill the night before, but we still had seven amazing people. The house needed some organizing and decoration, which mainly happened with the help and (super)vision of the fabuolous Cathy Jo, who, together with out host, turned the house into a candle-lit cavern of mystery. Everyone was very satisfied with the results, and the Japanese masks peeking around the corner in the bathroom to watch you pee. Cathy Jo opened the evening with a story from Malaysia titled Tenuk and the Toyol, about demons who prey on pregnant women, and demon babies that drink blood and like shiny things. It was haunting and terrifying at the same time, and told with a lot of wit and ingenuity. In the other corner we had a first-time MythOff teller, Gareth Van Camp, who told us the cliffnotes version of the Exploits of Ninurta with conviction and voice that carried into the far ends of the room. He would have gotten good money for that delivery in ancient Mesopotamia. The question that was put to the voting audience was: The monster most likely to terrify you as a child. Demon babies trumped Mesopotamian rock giants. Go figure. Another newbie, Kim Bushor-Maki, brought us the sweet tale of Psyche and Eros, told with humor and kindness. And when we were all wrapped comfortably in the fluffyness, Griffin Van Camp took over, and told us the Aztec story of how scorpions were created because a man killed another man and his wife because he was sleeping with the Goddess of Filth. Um. Since the surprise voting question was Fluffiest lovie-dovie moment, you can guess which one took the cake. Still, I have to note that the scorpions finding their way back to each other were very cute in the end. Paul Herrin went all out on his delivery of an Australian Aboriginal Dreamtime myth. He really did his homework. For one, he made two didgeridoos and brought them along. He also brought clapping sticks. Before the story he encouraged all of us to participate in the experience and keep time wheile he boomed throught the didgeridoo, and reminded us that a story is a community experience. He told us a bit about the Dreamtime, then delivered a story about how the animals discovered death. In the end he asked us to close our eyes... and when we opened them a swarm of butterflies were flittering around, projected onto the ceiling. It was magical. So that was the story I had to follow with the Irish. I told the tale of Fergus Mac Leiti, the king that was ugly but no one told him for seven years. I really like this story and I enjoyed the heck out of telling it. It is funny in the beginning and touching in the end. The surprise question was Which secret I would most like to hear, and I was honestly surprised when the Irish won the vote. Seems like more people would like to know if they look ugly than to know what happens after death. Go figure. Since poor Travis was sick, the Chinese did not make an appearance. This last category was an honorary one for our third first-timer, Grayson Morris. She told us the Egyptian myth of creation, sometimes referring to her notes for all the names, but with a lot of charm. All the winners got were the titles (written on card in envelopes, Oscars-style), and we made a point of reminding our audience that this was about the stories, not the tellers. Joshua did a good job of that. We also had two t-shirts that a helpful friend donated to us - the first two MythOff t-shirts ever! We gave them out as door prizes to our audience. All in all, House of Myth ended up being a lot of work, but also a lot of fun. Also, the audience seems to have outgrown the house concert venue. Can't wait to see where we will end up next time!